The Prius PHV plug-in hybrid on display during an event to mark the Japanese launch of the car in in Tokyo. TOKYO -- Toyota's chairman, who led the development of the Toyota Prius, expects the latest plug-in hybrid vehicles will catch on with consumers far more rapidly than the original Prius did. Known as the "father of the Prius" for his role in popularizing the world's best-selling hybrid car, Takeshi Uchiyamada said he expected to sell 1 million plug-in hybrids in less than 10 years, the time it took for sales of its conventional hybrid vehicles to hit that mark. "Environmental awareness has become a bigger issue today than it was 20 years ago, and demand for environmentally conscious products has increased," Uchiyamada told reporters at an event to launch the latest plug-in version of the Prius in Japan. While the technology for plug-ins has developed rapidly, lowering costs, Uchiyamada said he had "no idea" exactly when plug-in sales would hit the 1 million mark. Since launching the original Prius, in 1997, Toyota has developed hybrid versions for around 40 of its models, and has sold a total of 10 million hybrid vehicles globally. Toyota set a similar target for the first generation of its plug-in Prius, of which only around 75,000 have been sold since its launch in 2012, largely due to its limited electric range of 26.4 km. The latest version has a range of 68 km according to Japanese standards. Due to a different methodology in measuring a car's electric mode range, the vehicles' range is listed in the United States as around 25 miles (40 km). 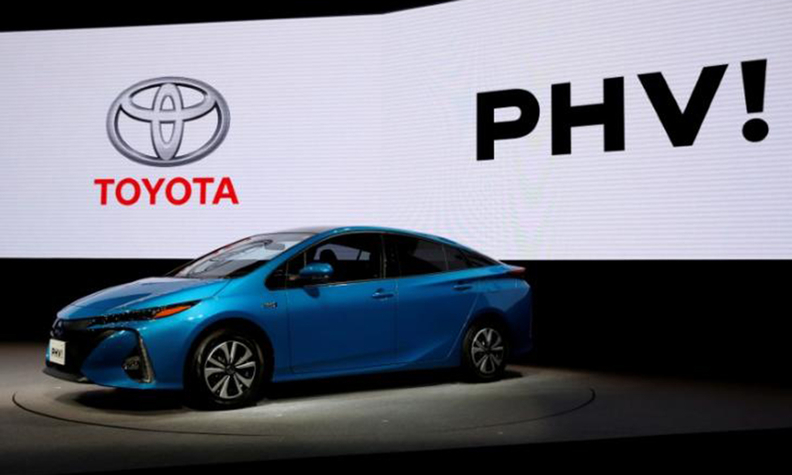 The latest plug-in Prius sees Toyota widely endorsing lithium ion batteries, marking a turning point for the company which for years had resisted the technology commonly used in all-battery electric vehicles, due to concerns over their cost, size and safety. While rivals including Nissan and Tesla have marketed electric cars for nearly a decade, Toyota has promoted fuel cell-powered vehicles as the most sensible next-generation option to hybrids, although a lack of hydrogen fueling stations remains a major hurdle for mass consumption.